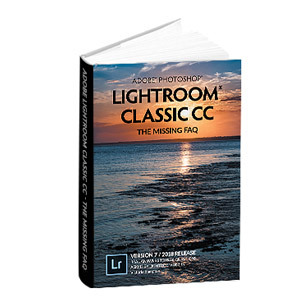 Lightroom Classic Tutorials > Catalogs > What is a Lightroom catalog? There are basically two different types of image management software – databases (catalogs) and file browsers. So what’s the difference? Let’s compare to a physical library of books to illustrate. A file browser looks at the files directly on the hard drive and organizes photos by folder. This is like walking straight into the library and looking round the shelves of books organized by topic. If someone’s borrowed a book, you won’t even know it exists. A database is a series of text records. This is like the library’s catalog of books. 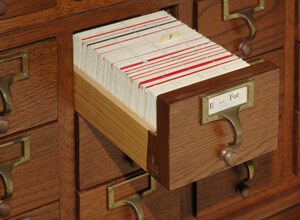 In the old days, it was made up of drawers full of cards, but these days it’s all computerized. Each card – or computerized record – contains information about the book, who wrote it, a description, its ISBN number, perhaps a picture of the cover, and most importantly, which shelf the book is stored on. The books themselves are still on the shelves. They’re not IN the catalog. If someone’s borrowed a book so it’s no longer on the shelf, you can still see the information describing the book, but you can’t read the book until it’s returned to its shelf. If someone moves the book to a new shelf, the information on the card is incorrect and you’ll be looking in the wrong place until the record is updated. Lightroom’s catalog works in the same way. Photos are never IN the catalog. The Lightroom catalog contains text records of information describing the photos, with small previews stored nearby, and most importantly, a note of where each photo is stored on the hard drive. If the hard drive is disconnected or a photo is moved to a new location, you can still see the information describing the photo and a small preview in the catalog, but you can’t work with the photo until the original file is found. 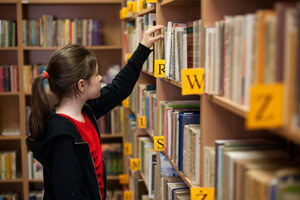 Why does understanding the catalog matter? We’re very familiar with working in file browsers. Windows Explorer and Mac Finder are used on every single Windows and Mac computer, so handling files in a browser comes naturally to most computer users. Catalogs are different. If you move, rename or delete a file outside of Lightroom, the records in the catalog won’t get updated to match. Lightroom will still be looking in the old location on the hard drive for the file, and won’t be able to find it. When this happens, you’ll be left with exclamation marks on the photos, and you won’t be able to edit or export the photos (just like you can’t read a library book until you find the book itself). As well as the information about the original image files, the catalog contains all of the work you’ve done to the photos. This includes flags, stars, keywords, captions, stars, flags, collection membership, and more. Even your Develop edits are stored as a series of text instructions in the catalog itself. While it is possible to store some of this metadata with the files (in a format called XMP), by default it’s only stored in the catalog. 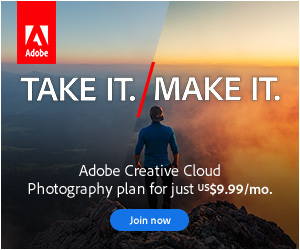 If you remove the photos from the catalog, all of your Lightroom edits will be gone. Even if you reimport the photos later, you won’t get this information back. Always rename photos within Lightroom, using the Library menu > Rename command. If you don’t, you have to fix the links one at a time. BIG job! Move photos within Lightroom by dragging and dropping them on another folder – or if you move them using Explorer/Finder/other software, update Lightroom’s records immediately, before you forget where you put them. Don’t remove photos from the catalog unless you’re also intentionally deleting the original photos (e.g. the fuzzy ones). Back up your catalog regularly. It contains a lot of essential information! So should you have one catalog or multiple catalogs? That’s up for discussion in the next post in the series. Hello Victoria, I trust this note finds you well. Ref this article, It states at the end – That’s up for discussion in the next post in the series. 1. Has this been done? 2. How can I access this, If done?